Relive Titanic’s momentous voyage from the perspective of those on board—the captain, engineering, first class, third class, the crew, the officers and even the band. Over 190 detailed tweets covering the events of the 14th/15th of April. Im Zuge der Aktion wurde auch eine App veröffentlicht. 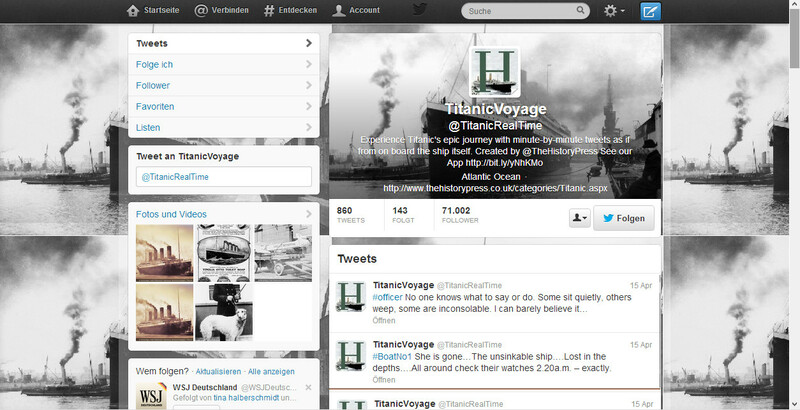 Mit 860 Tweets und knapp 71.000 Followern war der Account extrem erfolgreich. Als Publicity-Maßnahme für die Bücher und die App der History Press dürfte die Aktion also gut funktioniert haben, in der Presse wurde jedenfalls viel berichtet. Seit dem 12. Juli 2009 werden täglich 4 Tweets abgesetzt, die sprachlich an unsere Zeit angepasst sind und Geschichte emotional und auch mit Witz erzählen. Sehr spannendes Langzeitprojekt, das sich auf mehrere Bücher stützt. An @Arras95 interessiert mich persönlich vor allem der kollaborative Ansatz und das daraus entstehende Open Source Archiv. 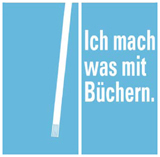 Einen Schritt weiter gehen dann Projekte, die fiktive Geschichten kollaborativ erzählen bzw. nachspielen. „War of the Worlds“ (H.G. Wells, 1898) wurde berühmt als Radiohörspiel erzählt von Orson Welles im Jahre 1938. Er lancierte das Ganze geschickt im normalen Programm versteckt, was von anderen Medien aufgegriffen wurde. Ob die Berichte einer landesweiten Massenpanik zutreffen – Leute, die die Landung von Aliens für bare Münze nahmen – sei dahingestellt, jedenfalls wurde Welles berühmt mit diesem Hörspiel und seiner Inszenierung. The War of the Worlds has several phases that I believe have strong analogs in the tense times leading to World Web II (point oh). a noteworthy astronomer speculates on the possibility of an alien invasion. This would be a good time to talk about the Drake equation in your blog, especially if astronomy is your hobby. Send an email towotw@cixar.com with your blog so we can proliferate it on the @wotw2 Twitter account. The alien invasion occurs. Follow @wotw2 to keep in sync with the progress of the invasion. This Twitter feed will automatically update, in general terms, the unfolding of the alien invasion like clockwork throughout the world. Coordinate with Tweeters in your area to tell local stories. cylinders fall from the sky. Tweet about where you are. Ask your friends where they are. Form posses. Skip town or take a closer look. tripods emerge. Flee, get stuck in traffic, or take refuge and tell us what you see. Martians begin obliterating every Terran metropolitan area with heat rays. Don’t call them heat-rays; that would be a dead giveaway. Describe what they do and come up with your own name! Do you work in a public service like hospitals or fire? What’s your job and what do you do? Do you organize your coworkers and flee? Do you head for the hills with your go-bag? Military, local militia, and national guard units get organized and attack the alien invaders. Do you serve in the military? This is your last chance to tell us where you’re headed. Do you have family in a militia? Try to keep in touch and let us know how and where they valiantly fought and lost. The invasion spreads from cities to countryside. Tripods begin to shut down an malfunction. Are you near one? Do you take a closer look? After the threat dies down, people begin to blog and speculate about what happened, and every topic near and dear to them.